Last updated 21 December 2018 . By Katie Houghton. If boots were made for walking, basements were made for margaritas. Some taco restaurants in London are neat and petite, while others are boisterous and bold. Breddos Soho? Well, they're legendary. 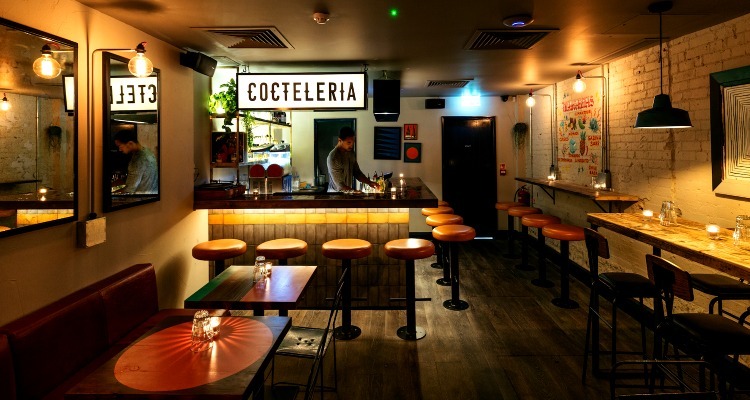 What started as a small stand in a car park back in 2011 has transformed into one of London's most notorious taco names... and this little restaurant generates quite the roar. No more than two weeks before Christmas, and with no more than 30 covers generating a buzz around the back of Carnaby Street, we joined Breddos for a night of traditional flavours and margaritas in their newly opened basement bar. With a wealth of experience that spans from Oaxaca to Mexico City, the owners at Breddos have created a menu in their upstairs taquiera that clings closely to tradition, while dipping its toes into European waters. Servings are generous here, as two tacos each alongside an enchilada is good enough for the night. Two stand out tacos were the vegetarian-friendly black beans with arbol salsa, wensleydale and pickle red onion at a decent £4.50 alongside the taco-champ of baja fish, habanero mayo and pickled red cabbage. That beautiful blend of the sweet and the sour atop a thin but friendly tortilla? It's enough to make a girl happy cry. Downstairs? That's where the marg-ic happens. The bar is a decent size and not shy of a little modernity, especially when it comes to the drinks selection. While the humble margarita shines, and slushies are readily available, it's the likes of their wasabi margarita with a soy salt rim that show you Breddos are here to play. The champion of the night? A rare take on the espresso martini: a white one, with horchata (a traditional drink of rice, milk, vanilla). Almost nutty and sweet, yet still strong enough to go a few rounds in the ring, the blend may come off angelic, but it's punchy enough to earn a respected place amongst its salt-rimmed siblings. Just shy of Carnaby Street, Breddos Soho and Cocteleria can be found at 26 Kingly St, Soho, London W1B 5QD.